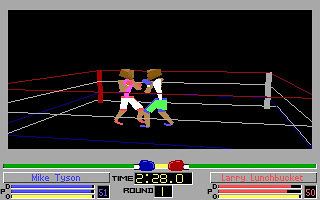 4D Sports Boxing is a boxing simulation game developed by Distinctive Software, Inc. (DSI). It was published by Mindscape in 1991. 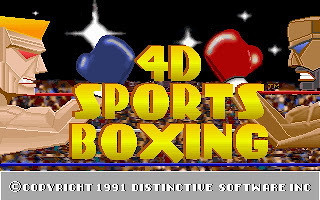 4D Sports Boxing do have some first in the computer gaming world, including motion capture animation and 3D graphics. Therefore we can see that the action is very smooth and very real. 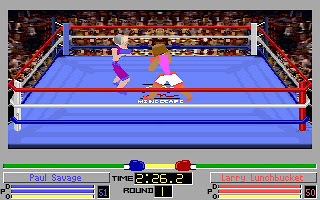 The game is one of earliest, and possibly first, examples of a 3D head-to-head fighting game. Though, with the limited computing power at that time, the game uses only polygon-based rendering. 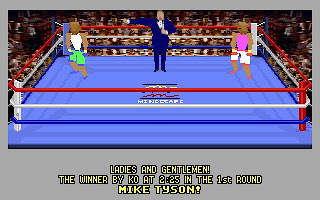 The name of the boxers resembles closely with those real-life boxers, like Mike Tyson. All opponent boxers have different fighting styles — some prefer to attack, some to counter-attack. Some have great punching power, some have amazing speed. The Champ has nearly perfect attributes. During the game, we can choose which attributes to improve in: speed, power or stamina. While fighting, different tactics and strategies can be used, like all-out attacks, counter attacks, dodging, etc. Sometimes fights end in a unanimous decision, even 15 round fights. Draws and disqualifications are also possibilities. You can download 4D Sports Boxing here.